October, the wind, the falling leaves... And there are also some heavy riffs, evil organ and flute coming to my ears... Yes, it's time! Stars are aligned, the ancient ones shall rise again "and with strange aeons even death may die". Alia O'Brien, bewitching queen of doom and prog rock accepted to answer our questions about a successful European tour, an exciting single, haunted Toronto and collecting records... Blood Ceremony will also share the stage with doom legends Pentagram and 70's hard rockers Bang for Halloween's night in Burlington, VT and NYC on the 1st of November! Get ready! Occult Rock Magazine: First of all, thank you Alia for taking the time to answer my questions for Occult Rock Magazine, it's a real pleasure! So first let's talk about your last European tour, what are your impressions/feelings about it? Alia O'Brien: Every time we've gone out on the road, we've been introduced to amazing bands and inspiring fans, but I would say that this was probably our best tour to date. The live shows were a lot of fun, and the crowds were really receptive, and we had the opportunity to perform in a few places that were completely new to all of us--most notably Moscow. The festivals on this tour were incredible--Temples and Freak Valley were both imbued with such distinct atmospheres, and FortaRock was a magnificent metal spectacle that also boasted a delicious spread provided by Iron Maiden's go-to catering company. Occult Rock Magazine: The Eldritch Dark Tour was also an opportunity for people to discover and buy your brand new single "Let It Come Down" back with "Loving You", could you tell us some more about it? How did you discover Iron Claw? I know that Sean has been in possession of a CD reissue of Iron Claw's S/T for a few years now, but I can safely say that our obsession with the song Lovin' You grew out of repeated, beer-addled listening sessions at our friend Katie's bar. When it came time to think about a B-side for our single, it was pretty much a no-brainer. We worked with Ian Blurton on the single, who also produced and recorded The Eldritch Dark, and were, once again, really happy with his work. We were also joined once more by violinist Laura Bates, who laid down a crunchy fiddle solo of epic proportions on the Iron Claw cover. Occult Rock Magazine: Is that new release a sort of prequel to a new album? What could we expect from it? In a songwriting sense, the forthcoming album will probably pick up where The Eldritch Dark and Let it Come Down left off, if that makes sense, although we're considering dirtying things up a bit. We're currently in the depths of songwriting, so we'll see what transpires! 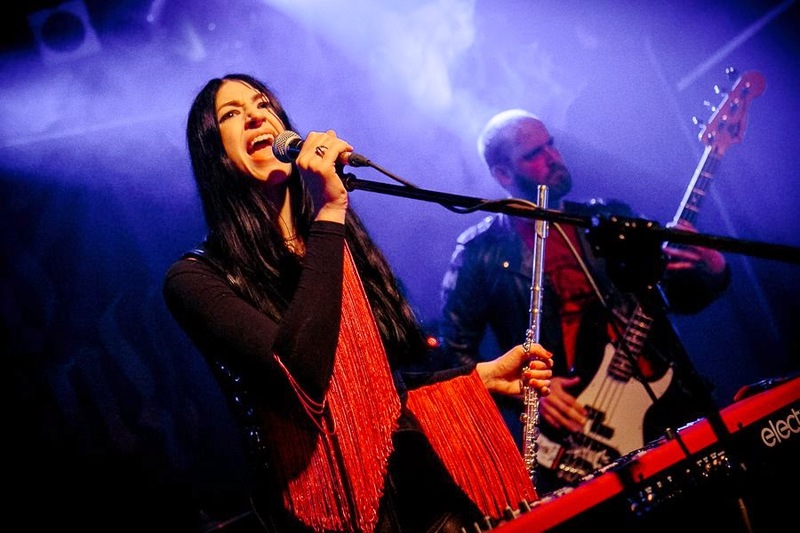 Occult Rock Magazine: What's the story behind Blood Ceremony, how did you guys met? Sean and I have been friends for a long time now--over ten years--and have spent a lot of time bonding over tunes; in the beginning, he introduced me to Witchcraft, I got him into Tull. Blood Ceremony was Sean's brainchild, and he initially brought me on board to lay down some Italo-prog inspired flute, but I ended up quickly taking on vocal and organ duties, as well. The band has since become a more collaborative endeavor, one that is still largely guided by Sean's vision. We've been through several lineup changes, but our bassist Lucas Gadke joined the band right before we recorded Living With the Ancients, and blew us away his masterful musicianship. Our drummer, Mike Carrillo, joined us for our North American tour with Ghost in 2012, and killed it. Mike and Lucas are an unstoppable rhythm section, and I feel like the band, in its current form, has congealed into an entity unto itself. Occult Rock Magazine: Blood Ceremony is definitely exploring the paths of 70's rock and occult themes, a dark imagery very reminiscent - in my opinion - of bands like Jacula, Antonius Rex and some other 70's Italian prog acts like Osanna and more obviously UK's legends Jethro Tull. Was that musical direction an evidence when you all met? Could you tell us a bit more about your personal, musical, cultural influences? Oh yes--these influences were certainly in the mix. I mean, we listen to all sorts of different sounds, and are constantly finding new/old pockets of music to get excited (or obsessed) about. I could write a book about the various recordings, films, and literary works that inspire us, but, for me, it's more enjoyable to listen to a song and imagine what the artist might have been immersed it the time that they wrote it. I was listening to T2's "No More White Horses" the other day, and became convinced that it was an tripartite homage to Ennio Morricone, CSNY, and Sabbath. It might have been the band's intention to invoke these artists, but perhaps I'm projecting my own tastes onto their song--either way, it's a bit more fun to revel in the uncertainty of it all. Occult Rock Magazine: Have you ever experienced any kind of supernatural event? Do you know any haunted places in Toronto? I used to work at a theatre down by Toronto's Lakeshore that was supposedly haunted by the ghost of a child, but I never crossed paths with her. I have had a few startling moments that some might label precognition, and others might attribute to coincidence or selection bias. Consciousness is a mysterious thing! Occult Rock Magazine: Do you prefer Live performances or Studio recording? I love them both equally! For me, live performance is all about achieving that perfect un-self-conscious state of flow, about the careful cultivation of a relationship with a crowd over a period of time, and about creating a compelling character/persona. The studio more as venue for collaborative negotiation, rumination, and precision. In my mind, however, the studio-performance dichotomy is a bit precarious, as good recordings, in some musical worlds, should convey some sort of "liveness," just as live performances benefit considerably from the playing and listening that take place in the studio. Occult Rock Magazine: Are you into old records from the 60's/70's? What's your opinion on the quite recent vinyl revival? What are your views on the also quite refreshing 60's/70's rock revival scene, any other bands from nowadays that you also like? The whole band has a weakness for vinyl--or, rather, we derive STRENGTH from our record collections! There's a definite abundance in heavy psych, prog, freakbeat, etc. from the 60s and 70s in there, but a lot of other stuff, too. I've been on a soul binge for the past few years, and you should see the "B" section of Lucas' collection: he's got Ludwig Van sitting right next to Belzebong. There are a ton of great bands that are currently active--we've been privileged enough to play with some of our favourites: Spiders, Electric Wizard, Witchcraft, Ghost, Uncle Acid--and basically all of our labelmates, for that matter. It's very cool to be a part of such a vibrant rock scene that stretches across time zones and oceans. Occult Rock Magazine: Desert Island question time! Could you give us one album, one movie, one book that you would take with you there? Occult Rock Magazine: Last lines... Would you like to share anything else, any thoughts with us? We've said it before, and we'll keep on saying it: do what your love tells you to do!